This is a new coupon on Save.ca’s website. Visit the site and print off your coupon. Some stores don’t accept printed coupons, but I’ve used my printed coupon at Walmart, Metro, Loblaws, Shoppers and had no problems. 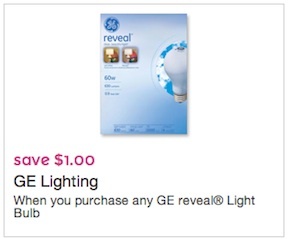 This is a printable coupon to Save $1 when yo purchase any GE reveal Light Bulb. 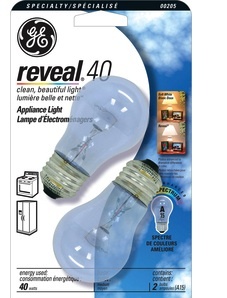 GE Reveal® bulbs fill your rooms with clean, beautiful light®. GE reveal® technology filters out dull, yellow rays, bringing out colors and patterns that go unnoticed under regular incandescent light. GE reveal® ceiling fan bulbs feature a rugged filament that resists fan vibration better than a standard incandescent bulb, making these bulbs the ideal choice for ceiling fans. These color-enhanced full-spectrum bulbs make colors and patterns pop, creating enhanced, vivid surroundings.